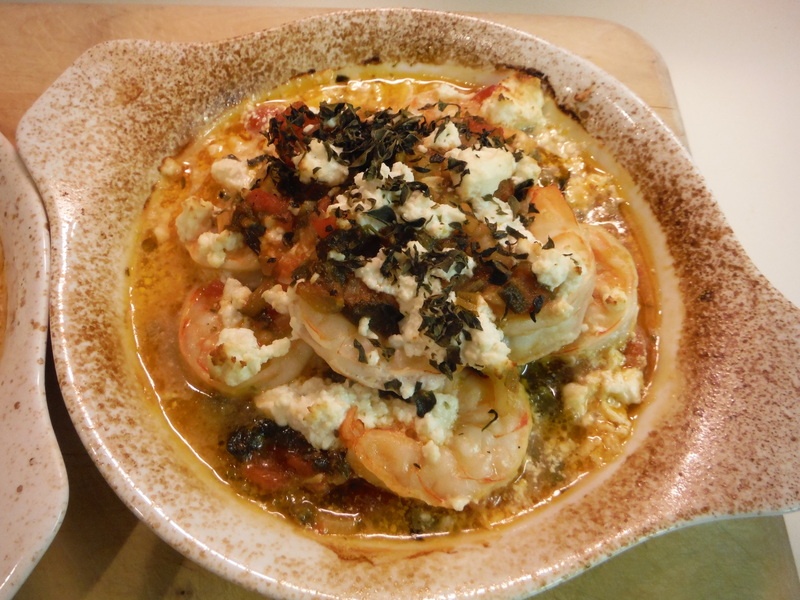 This is a variation of the classic Greek dish Garides Santorini (Baked Shrimp and Feta Santorini style) , adapted for Richard, a pescetarian who does not like celery. The adaptations were to replace the celery with chopped onion, and to make a shrimp-shell broth to replace the chicken broth. This trick of making a broth out of the shrimp shells can be generally used to enhance seafood dishes, such as seafood rice, paella, etc. Wash, peel, and devein the shrimp, and save the shells to make a broth. Dry the shrimp with a paper towel and place in a bowl. Sprinkle with the lemon juice and mix. Put the olive oil in a saute pan and saute the scallions, onion, parsley, and garlic until the scallions are tender. Add the tomatoes, bring to a boil, and then simmer for 20 minutes. Add the shrimp-shell broth and white wine. Stir well and simmer another 5 minutes. Check for seasoning. Place half of the sauce in the bottom of a shallow baking dish. Add the shrimp. Add the other half of the sauce. Sprinkle with the oregano and then with the feta cheese. Bake for 15 minutes, or until the cheese melts. Serve with crusty bread, a salad, and white wine.